20 Minute Vegetable Lo Mein is a super easy weeknight dinner that is loaded with veggies! Crisp vegetables and long noodles all combined in a flavorful sauce the entire family will love it! 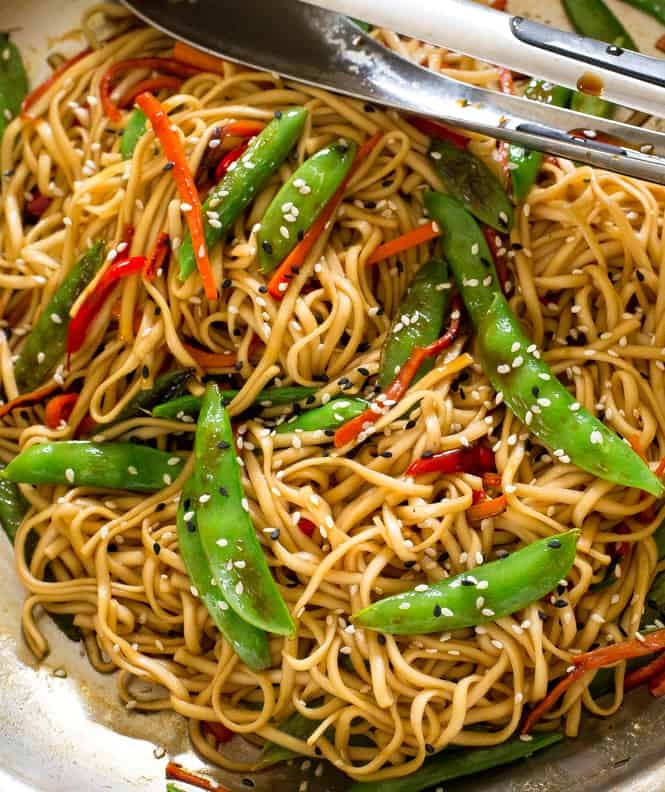 Skip the take out and enjoy this Vegetable Lo Mein dish at home with your family. It is a quick and easy meal that everyone will enjoy! If you like more take out recipes try this Super Easy Mongolian Beef (Tastes Just Like P.F. Changs! ), Garlic Beef and Broccoli Noodles or Beef and Broccoli Lo Mein. Hi guys! It’s Kelley back from Chef Savvy! Today I am sharing this Easy 20 Minute Vegetable Lo Mein! A quick and easy dinner that is ready in under 20 minutes. I love making my favorite take out dishes at home. They are super easy to make, taste a whole lot better and are healthier. 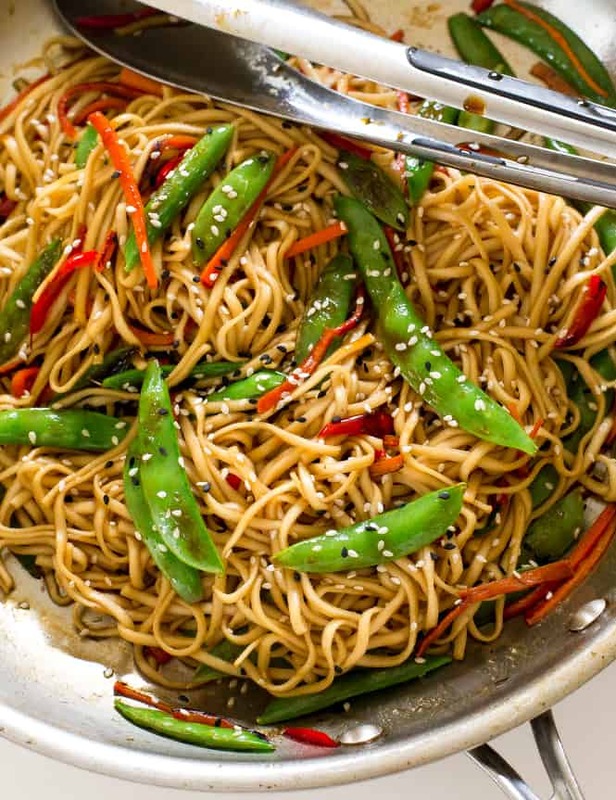 This vegetable lo mein is way better than takeout. I stir fried a mix of my favorite veggies: carrots, red pepper and snow peas. While the vegetables are stir frying I whip up a simple sauce made up of soy sauce, sesame oil, brown sugar and mirin. How Do You Make Vegetable Lo Mein? Add in red bell pepper, snap peas and carrots. Sauté until tender, about 5 minutes. Stir in the sauce and cooked noodles and toss to combine. Serve immediately with sesame seeds for garnish, if desired. In a small bowl whisk together the soy sauce, sesame oil, sugar and mirin. Set aside. The main difference between chow mein and lo mein is that different methods are used to make these stir-fry noodles. Both chow mein and lo mein use wheat-flour egg noodles. More authentic chow mein noodles are fried to crispness, while lo mein noodles are boiled to softness. Can You Make Vegetable Lo Mein Ahead of Time? Yes! You can prepare this Vegetable Lo Mein ahead of time by cooking the dish as instructed, then letting it cool completely and storing in an airtight container for up to 3 to 4 days. If you are going to store this, you will want to make extra sauce, because the noodles may dry out when reheated. Can You Freeze Vegetable Lo Mein? Yes! 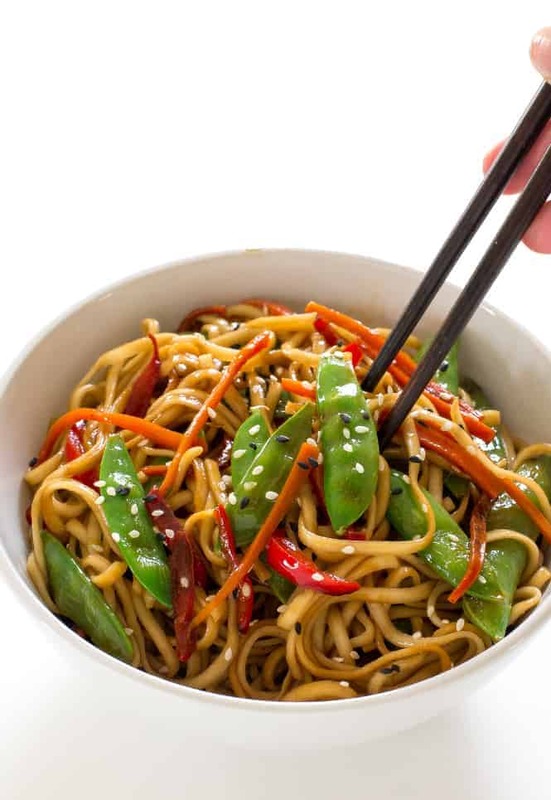 Vegetable Lo Mein is a great recipe for making ahead and freezing for up 6 months. Defrost the Vegetable Lo Mein in the refrigerator, then reheat in a wok or skillet, adding extra sauce as needed if your Lo Mein noodles seem to be dried out. I also like to freeze individual freezer bags for single servings for my boys to reheat for a quick snack if they need something fast. What Type of Noodles are Best for Lo Mein? 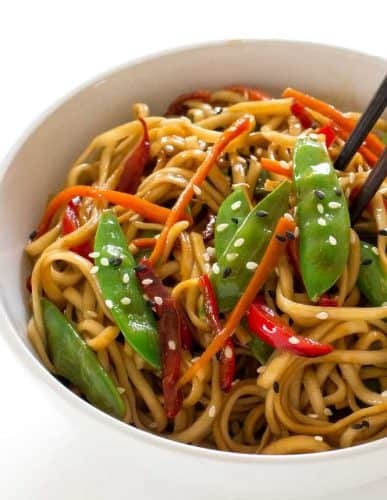 Both lo mein and chow mein are made with Chinese egg noodles – wheat flour noodles with egg added. Fresh egg noodles (preferably about 1/4-inch thick) are best for lo mein, while either fresh or dried can be used to make chow mein. What Kind of Vegetable Can I add to Vegetable Lo Mein? Want More Asian Inspired Meals? Here are some! This is vegetarian right ? Really yummy recipe. Make a whole meal by adding tofu and eggs! I’ve now made this recipe too many times to count and live it! I am so going to make this for dinner tonight! Yum! I can’t wait!